more on the "merits" of team libby’s june 25, 2007 reply. . .
weakness of team libby’s c.i.p.a. §6 final reply. . .
well, finally, the truth outs. . .
these facts, because — wait. . . wait. . .
or hamilton, emitted entirely by accident. ooh — clever rhetoric, no? well — that certainly clears it up. allow me to elaborate, ever so slightly. . .
patrick fitzgerald is a united states attorney. all the prevailing legal conventions of the day. and, mr.
robbins simply ignores this critical fact. is charged with all the rules applicable to u.s.
existed to charge people in the c.i.a. leak case. a reversal of his conviction. his motion should fail. judge d.c. appeals court panel. seems to be all you’re gonna’ have left. 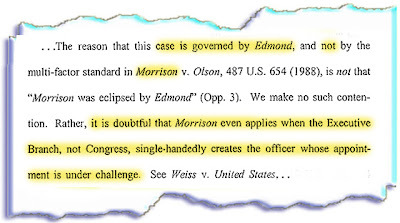 . .
See, e.g., Public Citizen v. Department of Justice, 491 U.S. 440,483 (1989) (Kennedy, 1., concurring) (“[T]he Clause divides the appointment power into two separate spheres: the President’s power to ‘nominate,’ and the Senate’s power to give or withhold its ‘Advice and Consent.’ No role whatsoever is given either to the Senate or to Congress as a whole in the process of choosing the person who will be nominated for [the] appointment.”); Myers v. United States, 272 U.S. 52, 122 (1926) (“The power of removal is incident to the power of appointment, not to the power of advising and consenting to appointment, and when the grant of the executive power is enforced by the express mandate to take care that the laws be faithfully executed, it emphasizes the necessity for including within the executive power as conferred the exclusive power of removal.”). . .